Hundreds of Beko tumble dryers, including a model that caused a house fire killing a mother-of-two, need to be fixed amid safety fears. "We will endeavour to repair affected machines within 10 working days once they have been identified and customers have been contacted," the company said. 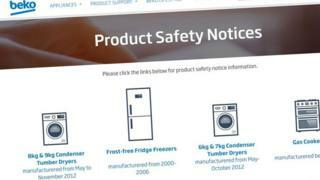 Emma Drackford, of charity Electrical Safety First, said: "Our research shows that one third of consumers said that they would continue to use a large appliance, even after it had been recalled. This is too big a risk to take. It is vital that consumers take Beko's advice by checking their tumble dryer and stop using their dryer if affected."